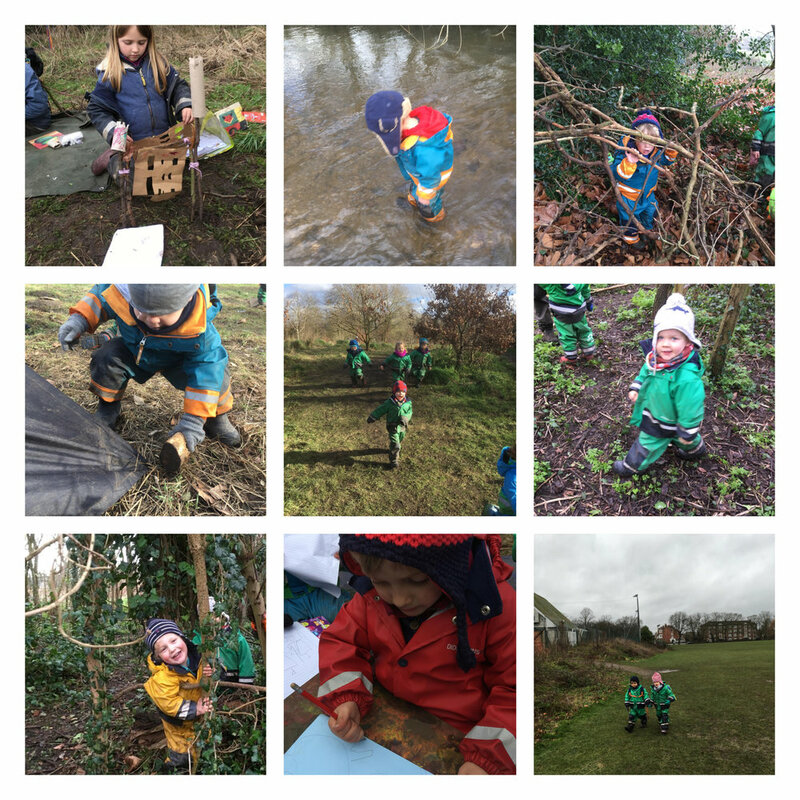 This week in the forest the children have been enjoying much milder weather and the return of some glorious mud! The sticky, slimy, gloopy mud has really come back in all its glory this week and the children have made the most of it. Every day the children have been collecting it and using it for various creative purposes. On one day, the children got together and created a huge strawberry chocolate cake. They went off in search of the best, most sloppy mud they could find so that it would mix well in their pots and pans. They spent a long time adding different ingredients such as leaf sprinkles, ivy and tiny sticks, all the while continuing to add more and more mud! Once finished, a huge birthday party started with lots of children coming to help set up for the party. They made presents, played games and then at the end of the party all the wonderful cakes exploded! One afternoon, a group of children decided that they wanted to visit the river. As we walked down to the banks we noticed that the water had receded and that perhaps we could walk down and look more closely at the river. The children showed great balance as they slid down the steep sides with a little help from an educator. At the bottom of the banks we found ourselves in the most thick, sticky and wonderful mud we had ever seen. The children quickly set about trying to walk through it and it did not take long before someone was stuck in the mud! It was great to see the trial and error techniques used to escape as the children twisted and pulled at different angles finally realising that if they pointed their toes up, twisted and pulled at the same time it would free the boot from the mud. The children then started to explore the squelching sounds that were being made as they lifted their boots out. They all found this highly amusing. 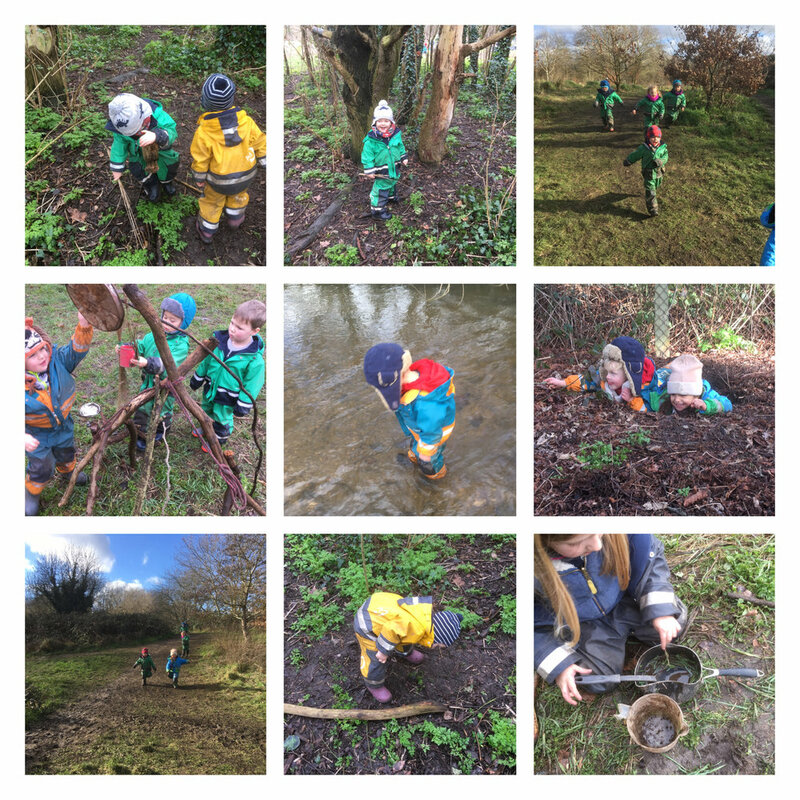 To clean their incredibly muddy boots the children decided to go into the shallows of the river and wiggle their boots around with the educators! Drawing, painting and mark making have also featured heavily this week with some wonderful projects starting up! The children have begun creating their own designs before going ahead and building them. We have had some children drawing pictures of castles, labelling different parts themselves and then using sticks, string and cardboard building a model replica complete with turrets and courtyard! Others designed trains, planes, princess houses and batman caves. They then used paints to paint, added sticks and string to bring their ideas to life! Our ongoing project to clear the common of rubbish to save the environment for the local flora and fauna has continued with great gusto this week. Every day the children are coming up to the educators and requesting that we get a bin liner and go on a “rubbish adventure!”. This week we have filled 6 bin liners with rubbish across the common. The children are extremely aware of the problems that rubbish can cause for the wildlife in nature. Alongside this they are also learning lots about how rubbish can be reused and recycled which can reduce the impact on the world as a whole. It’s amazing to see the minds of the future come up with creative ideas to help solve these huge problems! We hope you have a lovely weekend and see you next week! Older PostChiswick - Snow glorious snow!